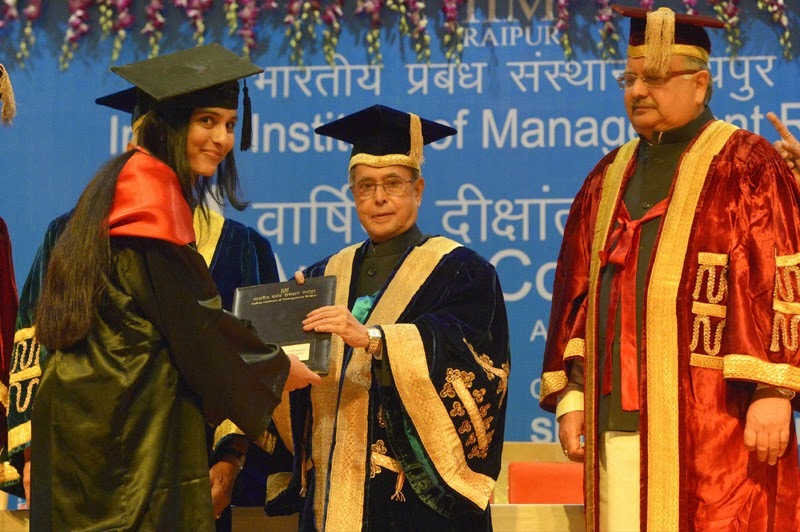 The President, Shri Pranab Mukherjee presenting the degree to a student at the 4th Annual Convocation of Indian Institute of Management (IIM) Raipur, at Raipur, Chhattisgarh on April 17, 2015. The Chief Minister of Chhattisgarh, Dr. Raman Singh is also seen. It is indeed a proud privilege for me to be present amidst you today for the Fourth Annual Convocation of IIM Raipur to deliver the convocation address. Education enriches lives, advances thinking, propagates new thought and enhances human capacity. Given that knowledge will spur growth in the future, it is essential that we prepare a large pool of skilled and capable manpower who can drive rapid economic growth of our country and enable us to deal with poverty, deprivation and backwardness. 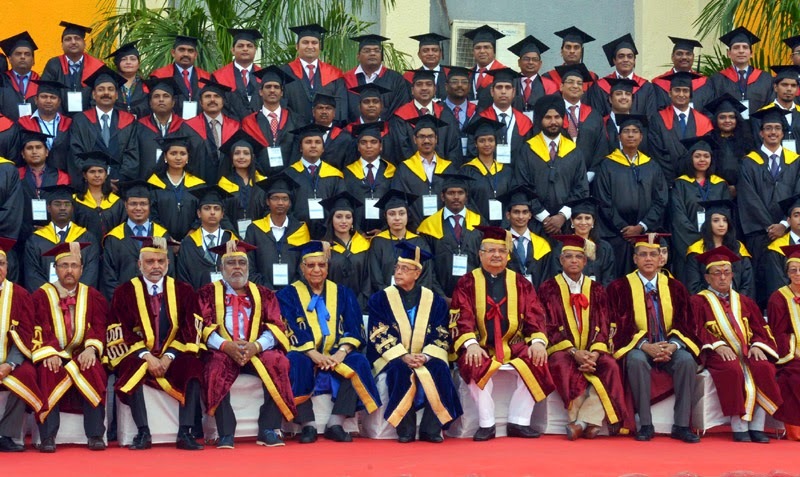 The President, Shri Pranab Mukherjee presenting with the students at the 4th Annual Convocation of Indian Institute of Management (IIM) Raipur, at Raipur, Chhattisgarh on April 17, 2015. The Governor of Chhattisgarh, Shri Balram Das Tandon, the Chief Minister of Chhattisgarh, Dr. Raman Singh and other dignitaries are also seen. Most prosperous nations and societies have built their economic success on the foundation of a sound education system and rich culture of research. Success in the 21st century will be increasingly dependent on innovation and the competitive use of knowledge. Keeping in mind the need to build a knowledge society, the Indian Institute of Management was set up in Raipur in 2010. I am happy that IIM Raipur is relentlessly pursuing its objectives of excellence in teaching, learning and human resource development. I understand the new state-of-the art campus at Naya Raipur will provide amenities comparable to any world class institute. Setting up of more and more institutions to impart higher education is important. In fact, the Ministry of Human Resource Development has announced that 22 new higher education institutions will be established. These are six new IITs, seven new IIMs, three IISERs four new Central Universities/Tribal Universities and one NIT as well as an IIIT spread over several states in the country. It is however equally essential that with the physical expansion of educational infrastructure, the education imparted to our students should also be of a high quality. The Government is also taking proactive steps to ensure that students receive the required knowledge and skills that are essential to meet new needs. An important decision taken recently in this regard is the setting up of a National Ranking Framework for higher educational institutions. I hope this will generate healthy competition amongst our institutions for excellence, including IIMs. The Government of India also plans to start SWAYAM or (Smart Webs of Active Learning for Young Aspiring Minds) Courses in OPEN, that is (Online Platform for Education) mode from 2015-16 for all learners interested in acquiring additional skills. This will enable our students and teachers obtain quality education at a fraction of the cost while solving the issue of access to higher education in remotest areas of our country. It will also help overcome the faculty shortage which is constantly a constraint in almost all our institutions. The Government along with the Indian Banks Association is also revising guidelines for ensuring financial support to each potential student so that no one is denied of higher education. This will empower meritorious students from low income groups benefit from quality education available at premier institutes such as yours. Management solutions are applicable to all domains. IIMs can partner with IITs and identify research goalposts that may have larger social relevance. While IITs could provide technical solutions for the same, IIMs can make available their managerial expertise. I am happy to know that IIM Raipur has partnered All India Institute of Medical Sciences in a novel initiative to develop programs in healthcare management. I am also glad that the centers for excellence planned at IIM Raipur are meant to address socially relevant problems, such as Resource Management, Energy Management, Disaster Management, Accreditation and Education, Healthcare Management, Innovation and Entrepreneurship Management. Our academic institutes have to be dynamic and hands-on in facing emerging challenges. Students today, far from being passive recipients of education imparted by the teachers, are active demand centres gradually seeking to re-define knowledge requirement. Institutions of higher education have to promote a culture of excellence and develop core competencies. They have to expand capacity to cater to more students and at the same time uphold the quality of instruction. They have to resort to technology tools like e-classrooms and knowledge to enable sharing of ideas and intellectual resources like lectures and tutorials. We must also be pro-active in developing a management research culture in the country for which IIMs need to collaborate with best of institutions in the world. The students of today would be engaged in their lifetime in jobs that perhaps do not exist today. They have to be taught critical skills and transferable competencies. They have to be infused with qualities of creative-thinking and problem-solving. They have to be encouraged in their quest to unearth the hidden and to experience joy in discovering the unknown. They have to be trained to possess a universal mindset to enable them interact in the melting pot of the globalized world. Research and innovation is the cornerstone of any academic endeavour. Their spin-offs could be large and immensely beneficial to wide spectrum of the society. It is innovation due to which industrial enterprises show high growth momentum and keep themselves ahead of their competitors. As per a 2014 international survey, there are only five Indian firms amongst the world’s hundred most innovative companies. We have to strive harder. Our academic institutions and industry have to engage with one another and benefit mutually from partnerships in joint research, curriculum development and setting up of chairs, incubation centres and research parks. IIMs must assume greater responsibility for overall development and mitigation of problems concerning our society, community and nation at large. The faculty in IIMs should provide consultancy for policy and project implementation challenges that both Union and State Governments face. Graduates from IIMs should take up projects of relevance to the people of the state and try start companies and corporation which would contribute to the economic development of the area. The Government has launched many important initiatives like Swachh Bharat Mission, Beti Bachao - Beti Padhao, Jan-Dhan Yojana, Make-in-India, Ease of Doing Business, Clean Ganga campaign etc. A concerted and determined effort to renew India, bolstered by ideas and imagination of a premier institution like IIM Raipur can help our nation realize Gandhiji’s dream of a Swachh and Samarth Bharat. Let me congratulate all the graduating students on their success and achievement. Convocation signifies the culmination of the phase of formal education. It also symbolizes the beginning of a new journey where the knowledge you have gained and the skills you have acquired will be put to sterner test. You will achieve success but at times you may face adversity. It is in mitigating those trying circumstances that you will prove your mettle. Your discipline, commitment and determination will help you navigate through difficult terrain. Remember that leaving this academic world does not mean you stop learning as there is knowledge to be gained everywhere and almost everyday from life. Life rewards those who engage in life-long learning. I request the student community of IIM Raipur to always keep in mind the fact that this wonderful education you have received is a contribution of the nation, state and community. The nation invests in its Institutions and Universities because students are our future. Students, in turn, have an important responsibility, not just to themselves and their families but also to this country and the community as whole. I am confident that the students who have earned their degrees today will take part in nation-building of this great country in a meaningful way. The youth of our country are the future stewards of this nation and inheritors of a glorious civilization. As we march towards becoming a developed nation, each one of you can play an important role in our progress. If the targets of eradication of poverty, health for all, education for all, power for all and higher living standards for all are to be achieved in the near future, it is our youth who must rise to the challenge. Strive hard not only to achieve your goals but also to make this country a better place for everyone who lives here. I wish you a bright career and fulfilling life ahead. The President of India, Shri Pranab Mukherjee attended the 4th Annual Convocation of Indian Institute of Management, Raipur today (April 17, 2015) at Raipur, Chhattisgarh. Speaking on the occasion, the President said that our academic institutes have to be dynamic and hands-on in facing emerging challenges. Institutions of higher education have to promote a culture of excellence and develop core competencies. They have to expand capacity to cater to more students and at the same time uphold the quality of instruction. They have to resort to technology tools like e-classrooms and knowledge to enable sharing of ideas and intellectual resources like lectures and tutorials. He stated that we must also be pro-active in developing a management research culture in the country for which IIMs need to collaborate with best of institutions in the world. The President said that our academic institutions and industry have to engage with one another and benefit mutually from partnerships in joint research, curriculum development and setting up of chairs, incubation centres and research parks. IIMs must assume greater responsibility for overall development and mitigation of problems concerning our society, community and nation at large. The faculty in IIMs should provide consultancy for policy and project implementation challenges that both Union and State Governments face. Graduates from IIMs should take up projects of relevance to the people of the state and try start companies and corporations which would contribute to the economic development of the area. The President expressed happiness that IIM Raipur is relentlessly pursuing its objectives of excellence in teaching, learning and human resource development. He stated that he was given to understand that the new state-of-the art campus at Naya Raipur will provide amenities comparable to any world class institute. A concerted and determined effort to renew India, bolstered by ideas and imagination of a premier institution like IIM Raipur can help our nation realize Gandhiji’s dream of a Swachh and Samarth Bharat. He requested the student community of IIM Raipur to always keep in mind the fact that the wonderful education they have received is a contribution of the nation, state and community. Students, in turn, have an important responsibility, not just to themselves and their families but also to this country and the community as whole. He expressed confidence that the students who have earned their degrees today will take part in nation-building of this country in a meaningful way. The Vice President, Shri Mohd. Hamid Ansari addressing at the “Remembrance Meeting on the occasion of Chehlum of Hazrat Khwaza Hasan Sani Nizami RA”, in New Delhi on April 17, 2015. The Vice President of India Shri M. Hamid Ansari attended the “Remembrance Meeting on the occasion of Chehlum of Hazrat Khwaza Hasan Sani Nizami RA” here today. Addressing on the occasion, he said that Hazrat Khwaza Hasan Sani Nizami RA was a towering personality in Delhi and was a very kind hearted person who always worked for the welfare of the people. The Vice President released a book on Khwaza containing articles, photographs and condolence messages on the occasion. The Vice President, Shri Mohd. 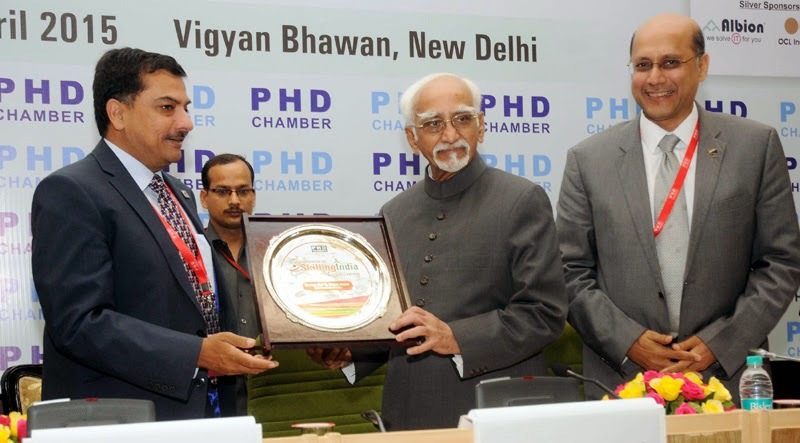 Hamid Ansari addressing the “Conference on Skilling India for Global Competitiveness”, organised by the PHD Chamber, in New Delhi on April 17, 2015. 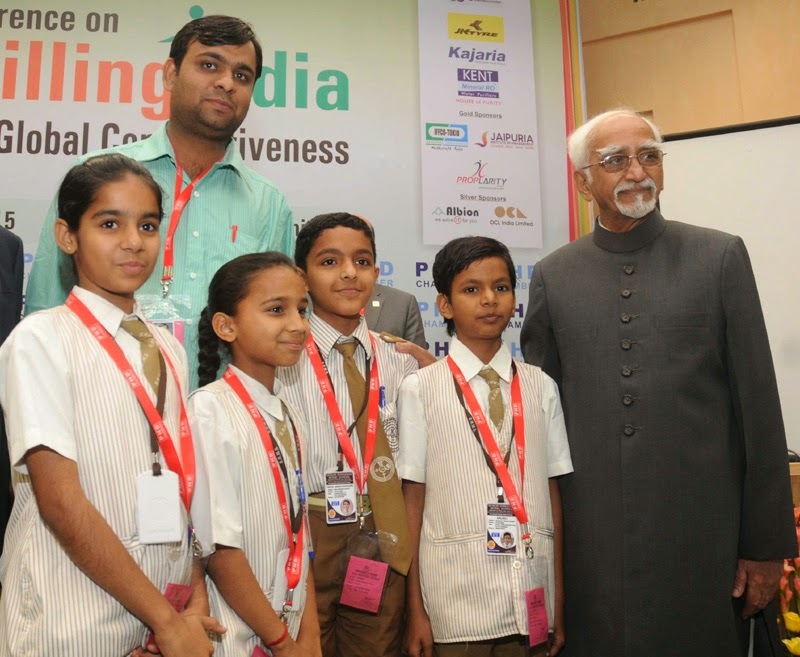 The Vice President of India Shri M. Hamid Ansari has said that in the twenty first century, the competiveness of a country in the global market place would depend on the strength of its economy, its contribution to existing and emerging branches of science and technology, and its ability to respond to the imperatives of a globalising world. Addressing at the ‘Conference on Skilling India for Global Competitiveness’ organized by the PHD Chamber of Commerce and Industry here today, he has said that knowledge and skills would increasingly become the primary determinants of economic growth and development. Countries with higher and better levels of skills will adjust more effectively to the challenges and opportunities of growth in a globalized world. He said that for us in India, skill development would be critical for achieving faster, sustainable and inclusive growth on the one hand and for providing decent employment opportunities to the growing young population on the other. Skill building will also remain a potent tool to empower the individual and improve his/her social acceptance or value. The Vice President said that today, significant challenges need to be addressed before we can reap the demographic dividend. Around 12 million youth enter the work force each year, most with poor education and negligible work skills. Our current skill training capacity is only about 4 million per year. This leads to an inherent skill deficit in the emerging work force. He said that the latest NSSO Survey indicates that the general education level of over 50% of our labor force remains extremely low and only 10% of the labour force was vocationally trained. It shows that 80% of the entrants to the work force do not have the opportunity for skill training. This means that besides creating employment opportunities for a large and growing work force, we also need to correct the low levels of general education and lack of vocational training of the existing labour force in order to enhance its employability and productivity. 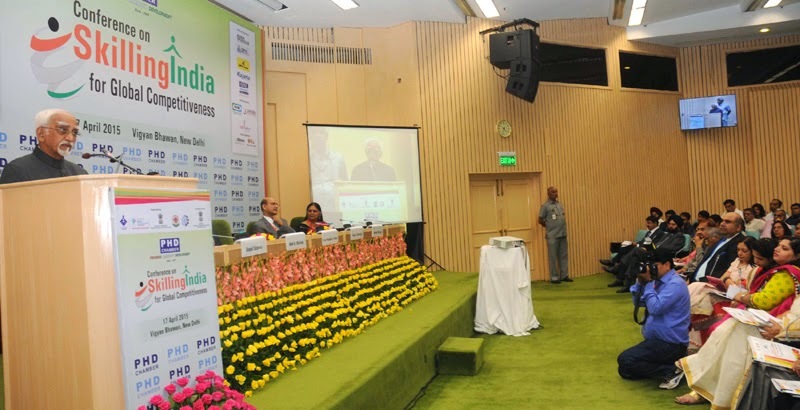 The Vice President opined that Government is cognizant of the importance of skill development for our national development and global competiveness. It has put in place the policy and institutional frameworks and dedicated resources for implementing the national skilling agenda. The realization of this agenda will have to be based on a vigorous partnership between government, suppliers of educational services, industry and civil society. Failure to do so would have serious economic and social implications for the country. “I am happy to be here today in this Conference on Skilling India for Global Competiveness. I compliment the PHD Chamber of Commerce & Industry for their continued focus on this important issue of skill development, which will remain a critical ingredient in the realization of our inclusive development goals. I recall attending a conference on skilling in schools, last year, also organized by the Chamber.The Conference is well-timed. It provides a useful platform for all stakeholders to deliberate on various aspects of skill development and perhaps find solutions to the related challenges. In the twenty first century, the competiveness of a country in the global market place would depend on the strength of its economy, its contribution to existing and emerging branches of science and technology, and its ability to respond to the imperatives of a globalising world. Knowledge and skills would increasingly become the primary determinants of economic growth and development. Countries with higher and better levels of skills will adjust more effectively to the challenges and opportunities of growth in a globalized world. For us in India, skill development would be critical for achieving faster, sustainable and inclusive growth on the one hand and for providing decent employment opportunities to the growing young population on the other. Skill building will also remain a potent tool to empower the individual and improve his/her social acceptance or value. India will remain a young nation and the largest contributor to the global workforce over the next few decades. It is estimated that by 2030, India will not only be the world's most populous country but it will also have the largest working-age population in the world, comprising around two-thirds of our total population. In absolute terms, this translates into a very large number. We will also have the world’s youngest work force with a median age way below that of the OECD countries and China. These favourable demographics position India to fill the void created by countries with an ageing population, and become a major player in global business. This demographic profile could be a potential source of strength for our economy provided, and I repeat provided, we are able to equip and continuously upgrade the skills of our population in the working age group and provide them with productive and gainful employment opportunities. Today, significant challenges need to be addressed before we can reap the demographic dividend. Around 12 million youth enter the work force each year, most with poor education and negligible work skills. Our current skill training capacity is only about 4 million per year. This leads to an inherent skill deficit in the emerging work force. The latest NSSO Survey indicates that the general education level of over 50% of our labor force remains extremely low and only 10% of the labour force was vocationally trained. It shows that 80% of the entrants to the work force do not have the opportunity for skill training. This means that besides creating employment opportunities for a large and growing work force, we also need to correct the low levels of general education and lack of vocational training of the existing labour force in order to enhance its employability and productivity. India is among the countries in which employers are facing difficulty in filling up the jobs. The lack of available applicants (only 61% of the working age population is available for work), inadequate domain knowledge and shortage of suitable employability, including soft skills, are some of the key reasons for the prevailing situation. The Indian labour market faces a strange situation where, on the one hand, an employer does not get manpower with requisite skills and, on the other, millions of job seekers do not get employment. The mismatch in demand and supply is as much in jobs that require basic vocational skills like welding, plumbing and paramedics as it is in jobs that require highly skilled manpower. We turn out nearly seven lakh science and engineering graduates every year. However, industry surveys show that only 25 percent of these are employable without further training. Another study shows that only 10% of the MBA graduates are employable. The picture is more dismal in other disciplines if recent, non-official employability reports are to be believed. These findings have sparked off serious concerns about the mismatch between the education system and the needs of the job market. The education system will therefore have to gear itself to support nation’s economic agenda by creating job-ready and employable workforce through increased focus on imparting vocational and technical skills. Thus there is an urgent need to mainstream skill formation in the formal education system and simultaneously introduce innovative approaches for skill creation outside the formal education system. The gaps in skill development should be identified so as to achieve the objectives in terms of quantity, quality, outreach and mobility. The availability of both physical infrastructure and human resources to impart skill-based training should be addressed in an effective manner. Quality and relevance of skill development are key to India’s global competitiveness, as well as improving an individual’s access to decent employment. To increase the relevance of skill training with future labour markets, soft skills and entrepreneurship skills need to be made integral parts of skill development. We also need to change the societal mindset, which attaches a sort of social stigma to vocational studies and drives our students into aimlessly pursuing formal degrees without any employability. This would have to be complemented by making it economically rewarding for persons to become skilled. According to the NSSO survey (2009-10), 84 per cent of our total workforce was in the unorganised sector and 93% in informal employment. These workers generate around 60% of our GDP but form the bottom of the skill pyramid with low skills, poor productivity and low income. An important challenge would be to reach out to this sector, as it is not supported by any structured skill development and training system. A CRISIL Report ‘Skilling India The Billion People Challenge’ concludes that if we are to achieve and sustain double-digit economic growth in the near future, closing the skill gaps of the workforce will be critical, as India depends more on human capital than its peer countries that have a similar level of economic development. · constrain our productivity and economic growth. · enhance inequality and inflation in our society. · trap the majority of our workforce in disguised employment in the agriculture sector. · create a fiscal burden due to the need to fund social security schemes for transfer of income to a large, unemployed population, which could result in crowding out much needed expenditures on education, healthcare and infrastructure. · generate social tensions and instability due to presence of a large, unemployed and youthful population, which felt disempowered in every sense of the term. These will naturally affect our global competiveness as well. Government is cognizant of the importance of skill development for our national development and global competiveness. It has put in place the policy and institutional frameworks and dedicated resources for implementing the national skilling agenda. The realization of this agenda will have to be based on a vigorous partnership between government, suppliers of educational services, industry and civil society. Failure to do so would have serious economic and social implications for the country. I hope this conference will come forth with implementable suggestions for addressing this important national question.0 I thank you for having invited me. The Prime Minister, Shri Narendra Modi, today had extensive interactions with Canada's business community in Toronto. In his remarks during a meeting with 30 influential members of the business community, the Prime Minister described the relationship between Canada and India, as a bonding of capabilities and possibilities - saamarthya aur sambhaavnaayein. He said if capabilities and possibilities came together, they could together scale new heights. He urged Canadian businesses to explore new avenues in India, and spoke about the range of decisions taken by the Indian Government over the last ten months, to boost investment. These include raising FDI caps in Railways and Insurance, the Smart Cities initiative, the Clean Ganga initiative, and solid waste management and waste water treatment in 500 cities and towns. The Prime Minister said that the combination of democracy, demography and demand make India the most suitable location for Canadian companies to expand their businesses. Earlier, the Prime Minister interacted over breakfast with major Pension Fund Managers of Canada. He assured investors of a predictable and stable tax regime. He also had a separate meeting with Mr. Tim Wiseman, CEO, Canada Pension Plan Investment Board. The Minister of State for Development of North Eastern Region (I/C), Prime Minister’s Office, Personnel, Public Grievances & Pensions, Department of Atomic Energy, Department of Space, Dr. Jitendra Singh and the senior officials of the DoNER Ministry with the Web Ratna Award 2014 received from the Union Ministry of Information Technology for outstanding Website content, in New Delhi on April 17, 2015. 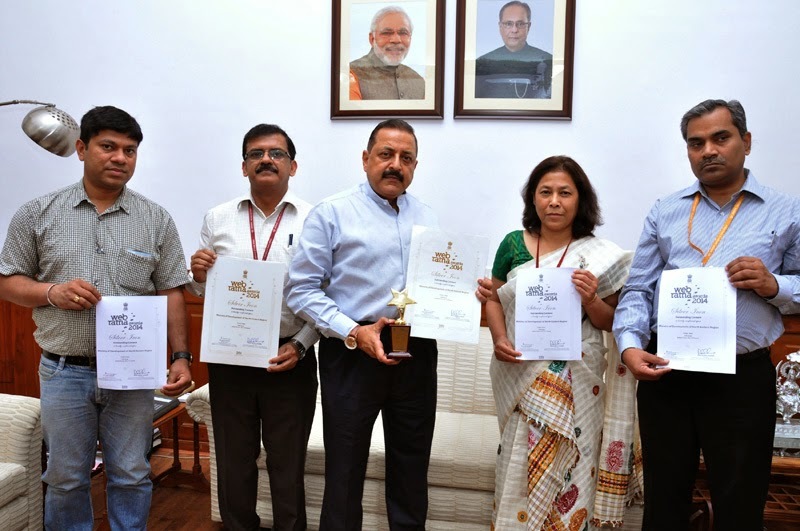 The Union Ministry for Development of North East Region (DoNER) headed by its Minister Dr. Jitendra Singh, has received the Union Ministry of Information Technology (IT) Award for outstanding Website content. The Award titled “Web Ratna Award 2014” under the category of outstanding content was conferred here in recognition of the exemplary efforts made by the DoNER Ministry for promoting e-governance initiatives. The website http://doner.gov.in created by the Ministry of DoNER is meant to serve as a portal on Northeast, providing information about every sector pertaining to the region as well as the current status of various projects related to tourism, flora fauna, educational institutions, universities, media and communications. In addition, it also provides information regarding demographic profile of the various States of Northeast, the socio-economic parameters and the projects undertaken directly by the DoNER Ministry or through North East Council (NEC). Complimenting the DoNER Ministry’s project team headed by Joint Secretary, Shri A.M. Singh and comprising among others Shri Ashim Kumar Jha and Shri P.K. Pankaj, the Union DoNER Minister Dr. Jitendra Singh said, their efforts for the last few months have not only made the DoNER Ministry more visible but also succeeded in bringing to the centre-stage, the various activities and initiatives undertaken in the Northeast. Being a far flung region with several areas remaining inaccessible or incommunicable, he said, an effective website portal will help in connecting to the people, particularly the youth, living in the remotest of the remotest areas. Dr. Jitendra Singh also disclosed that soon the DoNER Ministry will also have its own toll-free telephone number so that it is possible for anybody interested in the Northeast to call up and obtain the desired information without having to pay for the phone call. Meanwhile, he added, a Nodal Officer has been earmarked to exclusively receive the phone calls from citizens and members of the civil society at telephone number 011-23022304. Dr. Jitendra Singh said, the DoNER Ministry has started its activities on fast track both within Northeast as well as outside Northeast with the objective of showcasing Northeast to the outside world and called upon his colleagues in the Ministry to carry forward this mission with a renewed vigour and encouragement that has come in the form of the award received today.